Although Senator A. Willis Robertson — father of Regent University Founder, Chancellor & CEO Dr. M.G. “Pat” Robertson — passed away over 47 years ago, on Tuesday, December 4, students, faculty and staff at Regent gathered to celebrate his legacy at an annual lecture named in his honor. An ardent outdoorsman, U.S. Army officer during the first World War, statesman and namesake of the Robertson School of Government, Senator Robertson maintained fiscally conservative values throughout his political career. 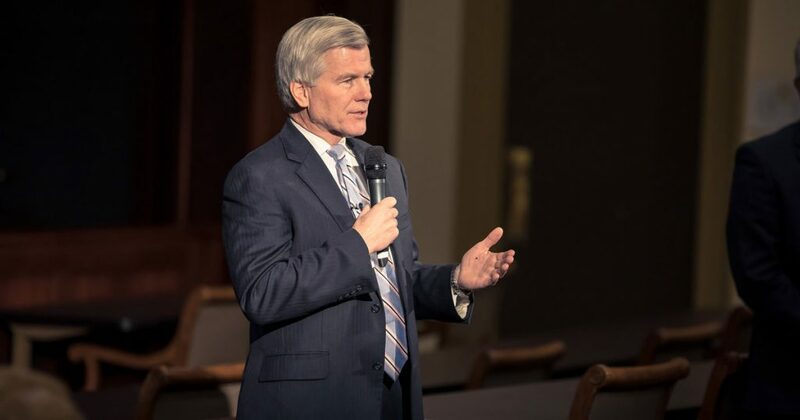 “To have his great legacy here at Regent, and for me to be allowed to speak today on some of these issues facing our nation is a treat,” said distinguished professor and former Virginia Governor Bob McDonnell. For more than 240 years, America has persisted, “exporting democracy [and] capitalism … throughout the world,” said McDonnell. And as always, a host of issues endanger its survival. Among them, he specifically addressed “trampling on federalism.” Federalism, in short, is a recognition of the need for local, state, and federal government each functioning within their intended capacity, McDonnell explained. As an adherence to federalism drops from American politics, the federal government continues expanding its bureaucratic reach — something Senator Robertson consistently voted against. McDonnell also warned those present not to engage in the “vitriolic and toxic” incivility that characterizes aspects of the current political rhetoric and atmosphere in the U.S. He asserted that the barrage of news and social media carry some responsibility for the digression in kindness and respect.